Richard Phillips Feynman was a prominent American scientist, widely considered to be one of the greatest and most influential theoretical physicists in history. Feynman revolutionized the field of quantum mechanics and formulated the theory of quantum electrodynamics. He won the Nobel Prize for Physics in 1965. Born on 11 May in 1918 in Brooklyn, Richard Feynman’s parents were of Jewish descent. Feynman earned his Ph.D. from Princeton University in 1942. Richard Feynman was one of the key figures in the Manhattan Project at Los Alamos during World War II. After the war, Feynman accepted teaching positions at Cornell and the California Institute of Technology. He was awarded the 1965 Nobel Prize in Physics for successfully resolving problems related to the theory of quantum electrodynamics. Feynman also formulated a mathematical theory that dealt with the phenomenon of superfluidity in liquid helium. In collaboration with Murray Gell-Mann, he extensively studied weak interactions such as beta decay. Feynman played a vital role in the development of quark theory by presenting his parton model of high energy proton collision processes. Feynman is credited with the introduction of fundamental computational techniques and notations into physics. The Feynman diagrams have radically changed the way in which basic physical processes are conceptualized and calculated. As a legendary educator, Feynman was awarded the Oersted Medal for Teaching in 1972. On a mission to increase the understanding of physics among the general public, Feynman wrote “The Character of Physical Law” and “Q.E.D: The Strange Theory of Light and Matter”. He also published various advanced works that have become definitive references and textbooks for scholars and students alike. 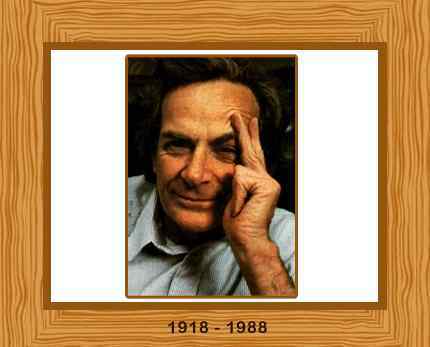 Richard Feynman died of abdominal cancer on February 15, 1988, in Los Angeles. He was 69 years old.